The object of this Demonstration is to show the continuity between the geometries of spaces with three different Gaussian curvatures, namely, hyperbolic geometry, Euclidean geometry, and spherical geometry. The figures and data shown reflect the continuous nature of the varying Gaussian curvature. As we change the Gaussian curvature, only the projections of the triangle vertices remain fixed. All of the other measures vary continuously. 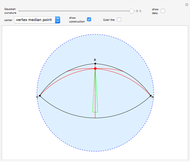 The stereographic projection is obtained by projecting from the antipode on the sphere of the tangent point at the center of the blue disk. When the Gaussian curvature is positive, the dashed blue circle indicates the projection of a great circle whose pole is the tangent point, and the green triangle is the polar triangle. When the Gaussian curvature is negative, the dashed blue circle indicates the edge of the Poincaré disk, that is, the absolute. The points A', B', C' are the antipodes of points A, B, C. Two triangle edges that meet at a vertex also meet at another point, which is the antipode of that vertex. The right-hand side of the final line of data gives the curvature of the circumcircle of the triangle on the left-hand side. The light blue disk is four units in diameter. The sphere has half the diameter of the disk if its Gaussian curvature is , since the Gaussian curvature of a sphere is the reciprocal of the square of its radius. As we reduce the curvature, the sphere increases in size. When the curvature becomes zero, the sphere becomes a plane, and there is no distortion in the projection. As the curvature is decreased more, the curvature of the sphere becomes negative, and its radius is imaginary. When the curvature is reduced to , the blue disk is equivalent to the Poincaré disk model of the hyperbolic plane. Incenter: This is the center of the circle within the triangle tangent to the edges of the triangle.The interior angle bisectors concur at this center. 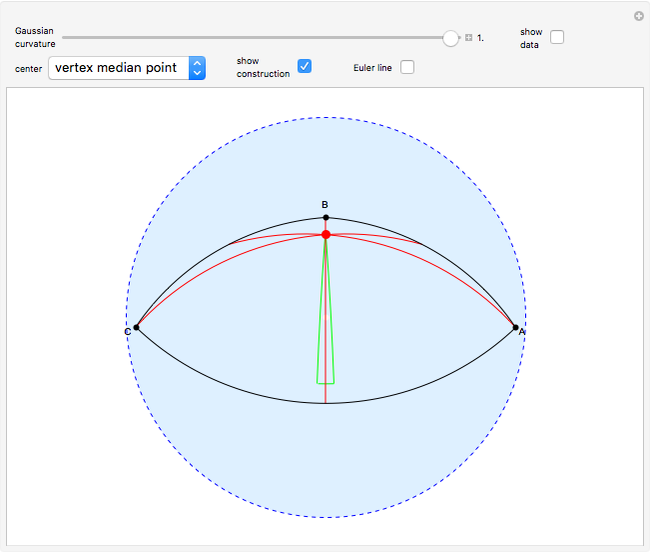 Vertex median point: The medians of the triangle concur at this point. Often referred to as the centroid of the triangle, it is badly placed to serve as a center of rotation for a non-Euclidean triangle. See Snapshot 1. Circumcenter: The perpendicular bisectors of the edges concur at this point, which is the center of the uniform curve through the three vertices of the triangle. It lies on the Euler line of the triangle. When the Gaussian curvature is negative, there is no projection of this point if the uniform curve is an equidistant curve. See Snapshot 2. Orthocenter: The altitudes concur at this point. When the Gaussian curvature is negative, there may be no projection of this point. See Snapshot 3. Euler circle center: The center of a circle (also called the Hart circle) tangent to the three excircles of the triangle. It lies on the Euler line of the triangle. See Snapshot 4. 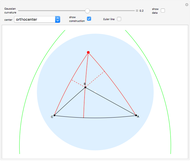 Area bisector center: The area-bisecting cevians concur at this point, which lies on the Euler line of the triangle. The feet of these cevians lie on the Euler circle. See Snapshot 5. Feuerbach point: The point of tangency of the Euler circle and the incircle. See Snapshot 6.
since the generalized polar sine of a line segment is the same as its generalized sine. Note that the first fraction is independent of any vertex, so that the last two fractions can be applied to the other two vertices and their opposite edges as well. The data also includes geodesic curvatures for certain uniform curves. 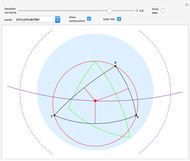 The incurvature row shows these for the excircles and incircle of the triangle. All of these uniform curves are tangent to the three edges of the triangle. The circumcurvature row indicates these for the circumcircles. 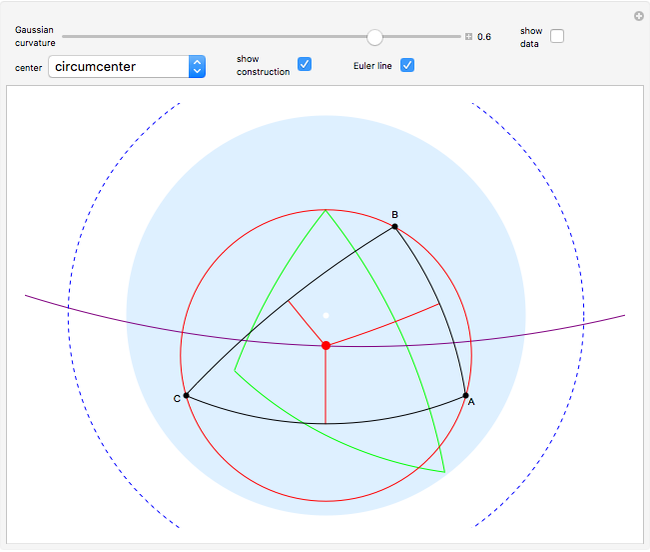 The principal circumcircle is a uniform curve through the three vertices of the triangle. The other three values are for pairs of antipodal uniform curves. Each pair includes one uniform curve through two vertices and the antipode of the third vertex and a second uniform curve through the third vertex and the antipodes of the first two vertices. In the last line of the data shown, indicates that the circumcurvature is for the uniform curve that passes through vertices and and the antipode of vertex . 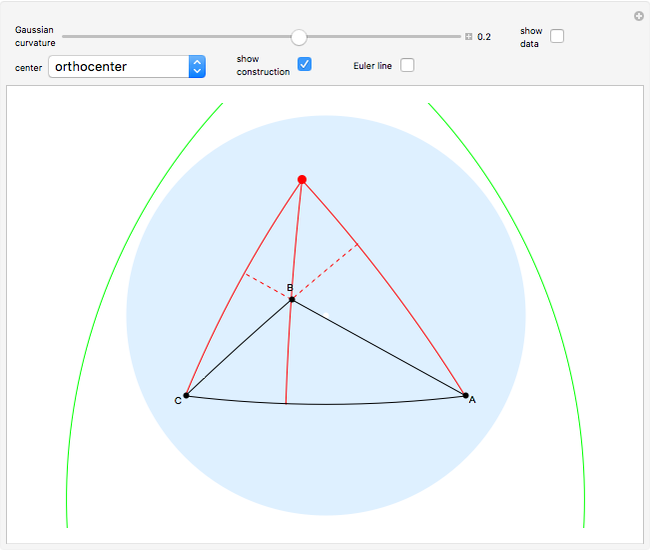 If the three vertices are collinear, the triangle is degenerate. In such cases we show the limits for the data and figures if such limits are unique. When the Gaussian curvature is and two vertices are antipodal, we presume that the edge joining them goes through the tangent point. A. V. Akopyan, "On Some Classical Constructions Extended to Hyperbolic Geometry," May 2011. arxiv.org/abs/1105.2153. J. L. Coolidge, "A Simple Proof of Hart's Theorem," American Mathematical Monthly, 23(1), 1916 pp. 14–15. books.google.com/books?id=5Q1LAAAAYAAJ&pg=PA14 # v=onepage&q&f=false. H. S. M. Coxeter, Non-Euclidean Geometry, 6th ed., Washington, D.C.: Mathematical Association of America, 1988. F. Eriksson, "The Law of Sines for Tetrahedra and -Simplices," Geometriae Dedicata, 7(1), 1978 pp. 71–80. www.springerlink.com/content/p582151224157175. A. S. Hart, "Extension of Terquem's Theorem Respecting the Circle Which Bisects Three Sides of a Triangle," Quarterly Journal of Pure and Applied Mathematics, 4, 1861 pp. 260–261. books.google.com/books?id=y9xEAAAAcAAJ&pg=PA260 # v=onepage&q&f=false. S. L. Kokkendorff, "Polar Duality and the Generalized Law of Sines," Journal of Geometry, 86(1-2), 2007 pp. 140–149. G. Salmon, "On the Circle Which Touches the Four Circles Which Touch the Sides of a Given Spherical Triangle," Quarterly Journal of Mathematics, 6, 1864 pp. 67–73. books.google.com/books?id=lhULAAAAYAAJ&pg=PA67 # v=onepage&q&f=false. Robert A. Russell "Non-Euclidean Triangle Continuum"